Buying a new mass spectrometer is a huge investment, and with the variety and diversity of mass spectrometers on the market, it is important to make sure you purchase the instrument that best fits your needs and will bring a good return for your investment. This buying provides you with information to help you make the right decision when choosing new mass spectrometry equipment. Learn about key factors and application considerations when buying a new mass spectrometer, and read impartial user reviews to help you to purchase with confidence. Scientists across many disciplines use mass spectrometry to identify unknown compounds, elucidate structures and quantify components in a sample, whether it is solid, liquid, or gas. A mass spectrometer measures the mass-to-charge ratio (m/z) of molecules (and/or its fragments) and atoms. A mass spectrometer consists of an ion source, an analyzer and detector system. Typically, as a sample is introduced to the spectrometer, it is bombarded with electrons and ionized, allowing the compounds to become charged and fragmented. The ions are separated by an electromagnetic field according to their mass to charge ratio (m/z). The detector system then detects the relative abundance of each of the resolved ionic species (Figure 1). Figure 1: a) Diagram of mass spectrometry1, b) Major components in a mass spectrometer. Tip: When choosing an ionization source, consider the nature of your analyte(s) – polarity, solubility, thermal stability, molecular mass. Also, does your analysis (analyses) require fragmentation of the analyte? Figure 2: Components of a mass spectrometer. (Definitions of the ion sources and mass analyzers can be found in the Glossary found at the end of this guide). Applications that require ultra-trace elemental analysis will use ICP-MS for excellent sensitivity, throughput and dynamic range. In the past few years, ICP-MS has been coupled to HPLC and ion chromatography for speciation analyses. Watch an exclusive SelectScience interview with Prof. Meharg from Queen's University, Belfast, about Quantification of Inorganic Arsenic in Rice using the Thermo Scientific iCAP Q ICP-MS. There are several kinds of ion sources and mass analyzers, but professionals in different fields tend to aggregate around specific configurations. For instance, in proteomics research, MALDI is a common ion source with TOF as the mass analyzer. MALDI is suitable for ionizing highly complex samples from protein-friendly buffers. The TOF is useful for its wide mass range capability. MALDI-TOF is also used in polymer analysis (polymers < 10 kDa). The rapifleX™ MALDI Tissuetyper™ from Bruker Daltonics (Figure 3) is an ideal choice for the identification of microorganisms. FT-ICR is a mass analyzer that determines the mass-to-charge ratio (m/z) of ions by measuring the cyclotron frequency of the ions in a fixed magnetic field. Analyses that require high resolution use high-end mass spectrometers, such as FT-ICR. As Ion mobility spectrometry-mass spectrometry (IMS-MS) is a relatively new technique, its applications will continue to grow. It is currently used in proteomics and metabolomics, as well as pharmaceutical, environmental and chemical analyses3, to name a few. Although ion mobility spectrometry (IMS) has been around for 40-50 years, the first IMS coupled to a mass spectrometer became commercially available only a few years ago. IMS-MS offers additional selectivity, making separation of isomers, isobars, and conformers possible, as well as measurement of ion size. Mass Spectrometers are frequently combined with separation techniques to form powerful integrated systems such as GC-MS, LC-MS, IC-MS, and CE-MS. The type of inlet or sample introduction dictates the choices for ionization sources. For example, electron ionization (EI) and chemical ionization (CI) are used with GC. HPLC is usually coupled to electrospray ionization (ESI) or atmospheric pressure chemical ionization (APCI). GC-MS couples gas chromatography (GC) with mass spectrometry (MS) to separate, quantify and identify volatile organic compounds. An example is the LCMS-8050 from Shimadzu, which provides combined liquid chromatography (LC) and mass spectrometry (MS) for separation and analysis of complex mixtures. Hear Professor Jack Henion, of Advion BioSciences, describe using LC-MS to analyze dried blood spots in the pharmaceutical industry (Figure 4). Tip: If you have an existing separations instrument (e.g. HPLC, GC) and want to couple it to a mass spectrometer, note that improved software integration and service support are achieved if both instruments are made by the same vendor. Analyses of volatile and semi-volatile organics by GC-MS are carried out across many fields. Electron ionization is the most common and probably the standard form of ionization, while quadrupole is usually the mass analyzer (there are other options, of course). There are several options for the analysis of non-volatile polar molecules, from stand-alone systems to the more commonly used LC-MS configuration. LC-MS is being used in many diverse applications, from research to routine analyses. (Common ionization sources and mass analyzers for LC-MS are found in Table 1). Organic molecules can also be analyzed using DART (direct analysis in real time). This instrument requires no sample preparation or significant method development, with potential applications ranging from forensics to food safety. Coupling two mass analyzers in tandem (tandem MS, hybrid MS)4 improves resolution, sensitivity, mass accuracy, and/or dynamic range. The difference between a tandem and hybrid MS is that the latter uses different types of analyzers for the first and second stages of mass analysis. Examples of tandem/hybrid MS are triple quadrupole (QqQ), quadrupole time-of-flight (Q-TOF), TOF-TOF, and quadrupole linear ion trap (QqLIT). Tandem quadrupole allows both sensitivity and robustness. An example is the Waters Vion™ IMS QTof™, (UPLC/MS/MS), which couples the benefits of ion mobility and greater separation power to routine analysis. Watch the video below to learn how this bench-top system can analyze every ion in a sample with minimal spectral interference and the generation of collision cross-section (CCS) values, enabling scientists to have more confidence in their analyses (Figure 5). Tandem MS offers additional sensitivity and selectivity over single stage MS. The application, sample characteristics and type of information you require from a mass spectrometer will dictate your need for either a single stage or tandem MS. Instruments that can undertake tandem MS are more expensive than single stage instruments. In a more applied setting, such as a pharmaceutical QA/QC laboratory, there is a need to process samples more quickly than a basic research laboratory, and a comparatively small, defined set of analytes need to be detected/measured. Thermo Fisher Scientific has recently launched the Thermo Scientific Q Exactive Focus MS, which enables selective quantitative and qualitative analysis in a single, affordable system. Watch this exclusive on-demand webinar to hear how Dr Hans Mol, of RIKILT Institute for Food Safety, uses this system to analyze pesticides residues in food samples (Figure 6). In other applied laboratories, ESI with a triple quadrupole mass analyzer is commonly used. There are a number of common mass spectrometer configurations used in different applications, both in research and routine analyses (see Table 1). Table 1. Popular mass spectrometry techniques/configurations (Definitions of the acronyms can be found in the Glossary at the end of this guide). What is your target analyte? What performance specificity do you require? Do you need high mass accuracy? What scan speed do you require? How selective does the mass spec need to be? Future-proofing: How many samples will you be running per annum? What service package do you require? Do you require a complete system? Is sample preparation needed? If so, do you need an integrated system? What characteristics and performance are required? By asking yourself these questions, you equip yourself with the knowledge and understanding to enable you to make the right purchase for you and your experiments. Mass spectrometry is being used in every application area, from research to routine analyses. Currently, the triple quadrupole is the most popular technology, used in GC–MS, LC–MS, and ICP-MS. Triple quads have proven to be extremely good for quantitation of trace level analytes, even in very complex samples, and as such, are used in a wide range of industries and applications, such as analyzing low-level contaminants in environmental water samples, detecting trace levels of pesticides and other health threats in foods, and quantitating key biological markers in the clinical sector. The high-end mass spectrometers – FT-ICR and Q-TOF – are typically used by the life science research sector, where high resolution is required in their research. Regulatory requirements are stringent and will only become more stringent. The environmental sector uses ICP-MS for very low-level elemental analyses, since other techniques do not offer the same level of sensitivity. ICP-MS has become the standard technique for monitoring the quality of fluids used in microchips and other electronics, which are incredibly sensitive to trace metal contamination. Work on LC-ICP-MS and IC-ICP-MS for speciation studies will continue. In clinical settings, the demand for mass spectrometers as medical devices that meet regulatory requirements continues to increase. Manufacturers are making significant contributions towards moving MS technology from clinical research to the clinical diagnostics environment. MS offers significant analytical advantages over traditional immunoassay techniques, particularly because of its high sensitivity and specificity. Applications of MS include disease diagnostics, therapeutic drug monitoring, metabolomics and protein quantification. Over the past few years, suppliers have been channeling increased resources into gaining clinical regulatory approval for their MS solutions in different regions of the world. Many new mass spectrometry instruments are expected to be certified for routine use in the US and European diagnostics markets in the next few years. In Europe and North America, there are now a number of regulatory approved MS-based clinical diagnostic systems and tests. Personalized medicine is currently a hot topic in health sciences. Watch this video to hear Professor Jeremy Nicholson, MRC-NHIR Phenome Centre, describe how delivering bespoke treatment to an individual, based on their genetic, metabolic and proteomic profile could be the future of healthcare. The use of mass spectrometry, together with NMR spectroscopy, enables an overview of thousands of metabolites in a single analytical run, covering a large number of physiological and metabolic processes. Personalized medicine has the potential to save lives and save money. Sportomics is similar to personalized medicine, but it analyzes an athlete's metabolic profile when undergoing exercise. Prof. L.C. Cameron of the Federal University of the State of Rio de Janeiro describes top-down research using 'omics', biochemical and hematological approaches to understanding cellular and systemic challenges in response to physical exercise. In food science, mass spectrometry can be used to determine speciation, geographical origin and aspects of food safety. Professor Christopher Elliott, of Queen's University Belfast, describes fish speciation using time-of-flight mass spectrometry. In forensic science, mass spectrometry is an immerging area. Designer drugs are analogous compounds of restricted drugs that are designed to circumvent typical drug analysis. Prof. Victor Weedn of The George Washington University, describes how criminals are using isotopic carbon in the synthesis of cocaine, whereby the mass of the compound is changed and may go undetected using standard methods. Time-of-flight mass spectrometry can be used to detect unknowns and determine accurate mass. Mass spectrometry imaging is an immerging technique, which enables the user to determine the spatial distribution of analytes and visualize their molecular masses. MALDI imaging, secondary ion mass spectrometry imaging (SIMS) and DESI imaging are the latest developments in this area. One of the challenges in MS is that mass spectrometers output 'big data'. Some can generate terabytes of data in a single day, so what do you do with all this data? There is a real push for manufacturers to come up with solutions to this problem, and cloud computing is seen as providing much of the answers. The accuracy and specificity of contemporary mass spectrometers have overtaken software development, so manufacturers are developing new software to enable both virtual sharing and virtual storage of data, and this is very much an ongoing development. Mass Spectrometry is a powerful analytical tool that has demonstrated its great potential over the last decade, and will continue to shape the direction of many scientific disciplines. It is routinely used in all areas of science, from environmental health, food and drug development, to cutting-edge materials, biological and electronics research. Choosing from the wide range of techniques and technologies available can be a daunting task, and it is essential to keep scientific application, performance expectations, and budget in mind. With such a fast moving technology, it is important to keep up-to-date with the latest advancements in technology. Sign up to the free SelectScience Analytical Chemistry Newswire to receive the latest mass spectrometry news and use the SelectScience product directory, user reviews and application note library to make more informed decisions when purchasing new equipment. Thanks to the How to Buy Mass Spectrometry Technology sponsors, Shimadzu Europa and Bruker Daltonics. Gordon Kearney, Steve Smith & Howard Read, Waters Corp.
David Edwards & Terry Sheehan, Agilent Technologies. Atmospheric-pressure chemical ionization; the ionization process occurs at atmospheric pressure through ion/molecule reactions. Atmospheric pressure photoionization; atmospheric pressure chemical ionization in which the reactant ions are generated by photoionization. Direct analysis in real time; it is a proprietary term indicating the formation of ions from a solid or liquid sample at atmospheric pressure through the interaction of a gas stream containing internally excited atoms or molecules with the surface. Desorption electrospray ionization; formation of gas-phase ions from a solid or liquid sample at atmospheric pressure through the interaction of electrosprayed droplets with the sample surface. Desorption ionization on silicon; a variant of MALDI; sample is deposited on a porous silicon surface. Extractive electrospray ionization mass spectrometry; analytes are first evaporated/nebulized and then ionized by collision with the charged droplets generated by the ESI spray. Electrospray ionization; the ionization process takes place at atmospheric pressure by passing a solution-based sample through a small capillary that is at a potential difference relative to a counter electrode. Fast Atom Bombardment; use high energy atoms to sputter and ionize the sample in a single step (like SIMS does); analyte is dissolved in a liquid matrix. A mass spectrometer operation mode, where a target range of mass fragments is specified; only ions within this mass range will be detected. The determination of what range to use is largely dictated by what you expect to be present in the sample, while bearing in mind the solvent and other possible interferences. Full scan is useful in determining unknown compounds in a sample. A mass spectrometer that uses different types of analyzers for the first and second stages of mass analysis in tandem mass spectrometry; examples are Q-TOF, LIT-FTICR, Q-LIT. 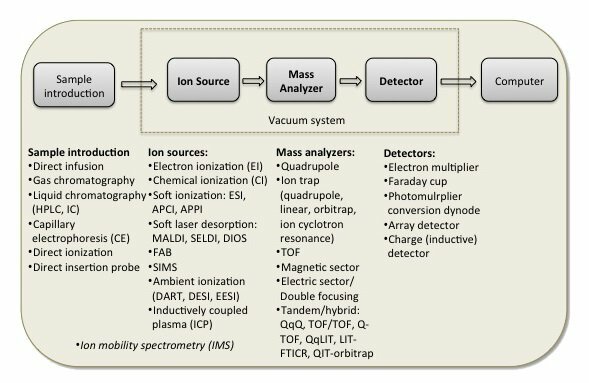 Ion mobility spectrometry mass spectrometry; a combination of an ion-mobility spectrometer (IMS) and a mass spectrometer (MS); first the ion mobility spectrometer separates ions according to their mobilities; in the second step, the mass spectrometer separates ions according to their m/z. hybrid mass analyzer that combines linear ion trap (LIT) and FT-ICR. Matrix assisted laser desorption ionization; ions are produced by pulsed-laser irradiation of a sample that has been co-crystallized with a solid; used to analyze extremely large molecules. Multiple/Selected Reaction Monitoring; the ability to follow a specific reaction species or multitude through the collision or reaction cell, giving a clear spectrum suited for target analysis using tandem MS setups. Mass-to-charge ratio; the dimensionless quantity formed by dividing the ratio of the mass of an ion to the unified atomic mass unit, by its charge number (regardless of sign). A trademark term for a type of ion trap (Kingdon trap); ions are orbitally trapped and oscillate harmonically along the trap axis; the oscillation frequency is inversely proportional to the square root of m/z. A hybrid mass analyzer that combines quadrupole (Q) and linear ion trap (LIT). Triple quadrupole; a tandem mass spectrometer composed of two transmission quadrupole mass spectrometers in series, with a (non-selecting) RF-only quadrupole (or other multipole) between them to act as a collision cell. A hybrid mass spectrometer composed of a transmission quadrupole mass spectrometer (Q) coupled to an orthogonal acceleration time-of-flight mass spectrometer (TOF); a collision quadrupole is typically inserted between the two mass spectrometers. array of four parallel rod electrodes whose centers form the corners of a square and whose opposing electrode pairs are connected; ions are separated based on oscillations in an electric field created with the use of rf and DC voltages. Often called just ‘ion trap’; a type of ion trap mass analyzer that confines ions using electric and/or magnetic fields and then selectively ejects ions of different m/z by ramping the rf voltage. Surface enhanced laser desorption ionization; a variant of MALDI in which the matrix is replaced by a surface coating designed to selectively retain proteins or peptides from a mixture depending on their physicochemical properties or biochemical affinity characteristics. Secondary Ion Mass Spectrometry; use high energy atoms to sputter and ionize the sample in a single step (like FAB does); used to study surface species and solid samples; no matrix is used. Signal to Noise ratio; a measure of a signal (peak) intensity relative to the baseline ("noise") level; for applications requiring high sensitivity, this needs to be very low. Also known as MS/MS or MS2 or MSn; involves multiple steps of mass spectrometry selection, with some form of fragmentation occurring in between the stages; can be accomplished with individual mass spectrometer elements separated in space or using a single mass spectrometer with the MS steps separated in time. Time-of-Flight; a mass analyzer that separates ions of different m/z by their time of travel between the ion source and detector, through a field-free region after acceleration by a constant voltage in the source (the ions will have differing velocities depending on their mass). A tandem mass spectrometer composed of two TOF analyzers. 3.) Jiang, W.; Robinson, R.A.S. Encyclopedia of Analytical Chemistry, 2013, John Wiley & Sons. 4.) Glisha, G.L; Burinsky, D.J. J Am Soc Mass Spectrom 2008, 19, 161–172. 6.) Mass Spectrometry in Polymer Chemistry (First Edition).Barner-Kowollik, C, 2010. "The Waters brand is the best for LC-MS/MS, and it has been proven again with the Xevo TQ-S. The instrument puts itself top in sensitivity..."
"User-friendly, very easy to use, after-sales service and support is fantastic and it is definitely value for money." "Amazingly sensitive and fast mass spec with incredibly high mass range and spectral resolution. A unique instrument that will remain cutting-edge for a long time." "This is an easy-to-use instrument. Even a novice can be assured that they will achieve their goals with the excellent support provided..."
"Agilent instruments are very well engineered and manufactured and this instrument is one of such examples. We are very satisfied with its performance..."
"I had used this instrument after a Phase I and II metabolic incubation. It was a really robust instrument with powerful software..."